What do Hugh Jackman, Lady Gaga and Leonardo DiCaprio have in common? Besides international celebrity, they are all owners of French bulldogs. You might also have noticed the frequent pictures on social media of Hugh Laurie, Jonathan Ross and Gerard Butler out and about with their pugs. Our celebrity-driven culture is surely one of the reasons for the increased popularity of these little dogs with their squashed-in faces and big eyes. Another is the fact that they are low-energy pets that don’t require much exercise, which appeals to time-short city dwellers. Such dogs are called brachycephalic, from the Greek words for ‘short’ and ‘head’. Popular breeds include pugs, French and English bulldogs, Pekingese, Boston terriers, boxers, Cavalier King Charles spaniels and Shih tzus—in fact, any dog whose muzzle looks like it has been flattened or squashed. Not all dogs with this feature will suffer health problems but too many do, and veterinarians will treat more of them as the temperature rises. 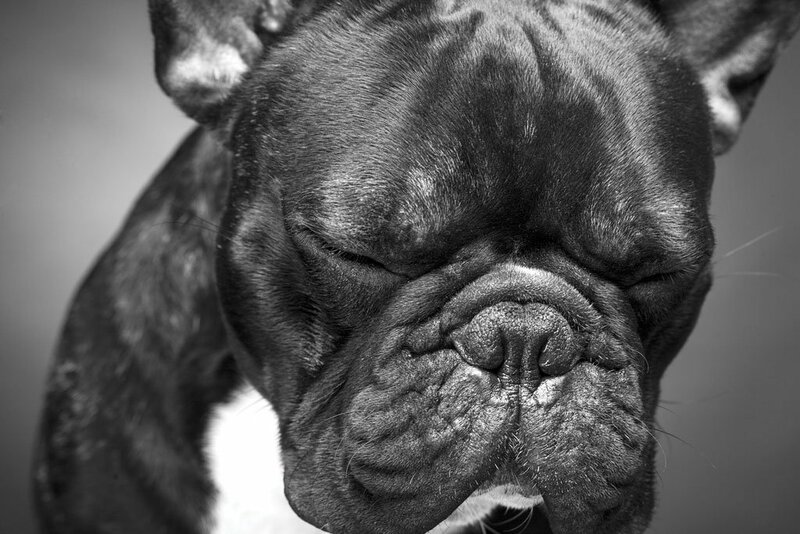 Short-muzzled dogs are at risk of developing Brachycephalic Obstructive Airways Syndrome (BOAS), and the shorter the skull, the higher the risk. The windpipe is often deformed and narrowed, which leads to tracheal stenosis, and the soft tissue around the mouth, nose and throat, which is squeezed into a smaller space, can partially block airways. Such dogs often have stenosis of the nostrils, making inhaling difficult. Clinical signs of BOAS include noisy and laboured breathing, gagging, choking, drooling, diarrhoea and vomiting, with the dog showing distress even on short walks. In summer, these difficulties are compounded and, if the animal is not cooled sufficiently and quickly, death may result. Dr Sean Wensley, senior vice president of the British Veterinary Association, likens the dogs’ breathing difficulties “to us as humans having to spend our entire life breathing through a straw”, a comparison which brings home to owners the suffering their pets endure. In 2016, the Australian Veterinary Association (AVA), together with the RSPCA, launched an ongoing campaign called Love is Blind, which aims to raise awareness of the health and welfare issues associated with flat-faced dogs. Dr Paula Parker, national president of the AVA, sees many of these dogs in her emergency practice. “At this time of the year, as the weather warms up, it’s not uncommon to have an ICU full of brachycephalic dogs that need urgent medical attention because they can’t breathe,” she says. But not all owners recognise the signs that their pets are suffering. According to to a 2012 survey by the Royal Veterinary College in Britain, 58 per cent of owners did not recognise the signs that their brachycephalic dog was struggling to breathe. It may take an acute attack, during which the dog may even lose consciousness, for owners to seek veterinary advice. If left untreated, BOAS can severely impact on a dog’s quality of life. Simple pleasures such as exercising, playing, and eating are all adversely affected. But there are other health issues owners of brachycephalic dogs need to be aware of, including high blood pressure, heart problems, low blood oxygen levels, dental issues and skin fold dermatitis. Giving birth can also present problems. According to a 2010 UK report, 86 per cent of British bulldogs and over 80 per cent of French bulldogs are delivered by C-section because the puppies’ large heads and the mothers’ narrow pelvises make a natural birth virtually impossible. Caesareans are major operations for any dogs, but especially so for flat-faced dogs with breathing problems. “Owners need to be aware that these dogs need extra love, attention and veterinary intervention to ensure the risks and any health issues are properly managed,” Dr Parker says. Hugh Gent, president of the Australian National Kennel Council (ANKC), points out that their registered breeders produce only 15 per cent of the puppies born each year; the remaining 85 per cent of breeders are not subject to any codes and there is little motivation for the majority to only breed from sound stock to reduce health problems. “This is particularly relevant to the breeders of brachycephalic breeds, especially French bulldogs which can sell for up to $15,000,” Gent said. In an attempt to weed out unethical breeders, the ANKC proposed a joint venture to the AVA involving veterinarians providing them with the microchip number of puppies who presented at their practices with breathing problems. However, the proposal had to be rejected. Gent says that ANKC Members Bodies are currently fundraising to import—at the cost of $46,000 each—Whole-Body Barometric Plethysmography Chambers developed by Cambridge University to assess respiratory traces that will help identify healthy breeding stock in brachycephalic breeds. 1. Ask them to first consider adoption through reputable animal welfare organisations. The Smart Puppy and Dog Buyer’s Guide by the RSPCA is supported by the AVA and includes information on how to avoid puppy farmers and other irresponsible breeders. 2. Make them understand the health and welfare problems characteristic for their chosen breed and the likely costs of veterinary care over the dog’s lifetime. 3. Discuss the ongoing special care they will have to provide at home, as well as the time, commitment and resources involved. The AVA has fact sheets on these topics which members can download. The AVA is encouraged by the results of the Love is Blind campaign and hopes that breeding and community standards will change, and the health and welfare of brachycephalic dogs will take precedence over their looks. In the UK, several government ministers recently calledfor stricter rules governing the breeding and online sales of brachycephalic dogs.